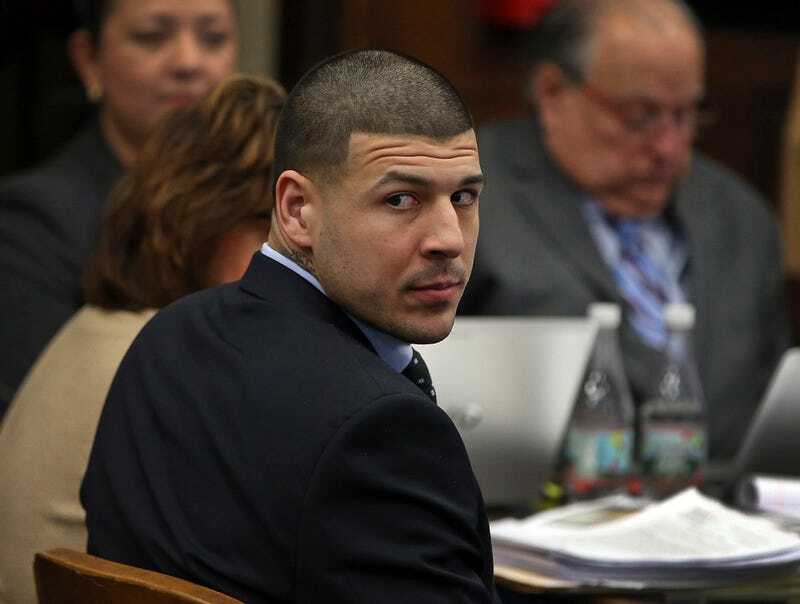 A jury in Boston went to deliberations this morning to come to a verdict on the homicide charges against former New England Patriots tight end Aaron Hernandez, stemming from a 2012 double homicide outside a Boston nightclub. Hernandez is already serving a life sentence for a 2013 murder, for which he was convicted in April 2015. Hernandez is accused of murdering two men, Daniel de Abreu and Safiro Furtado, after leaving a bar with his friend, Alexander Bradley. The former tight end was charged in connection to the drive-by murders after his June 2013 arrest for murdering Odin Lloyd, Hernandez’s fiancée’s sister’s boyfriend. Bradley testified in court that he was driving the Toyota 4Runner Hernandez was riding as a passenger in when they pulled up next the BMW de Abreu and Furtado were in with three friends outside of the nightclub. The prosecution’s proposed motive is that de Abreu spilled a drink on Hernandez when they were both inside the club, enraging Hernandez to a point of murder. The two survivors, Aquilino Freire and Raychides Sanches, testified against Hernandez in the trial. Hernandez is also charged with witness intimidation against Bradley stemming from a February 2013 incident—months after de Abreu and Furtado were murdered—when Bradley mentioned “the Boston stuff” and Hernandez allegedly shot him in the face and left him for dead. Bradley was the prosecution’s star witness during the double homicide trial, and was given immunity for his participation. He is currently serving time in Connecticut for firing 11 rounds outside of a Hartford bar. No one was harmed in the incident. In a closing statement delivered yesterday, Hernandez’s attorney Jose Baez—known for getting an acquittal for his then-client Casey Anthony during her own murder trial—made an impassioned argument that the prosecution had built its entire case around Bradley’s testimony and had not fairly pursued evidence he said indicated Hernandez was not the shooter. Baez, showing off the skill with which he used to secure Anthony’s innocence, said the prosecution’s case was “heavy on emotion and low on evidence.” He repeatedly called Bradley a liar and a perjurer. He additionally compared what he saw as inconsistencies in Bradley’s testimony to a food with cockroaches in it, asking the jury how many cockroaches they’d have to find before they’d send the food back—one. Baez strived to humanize Hernandez by asserting that a miscarriage of justice was being done to his client, and that if it could happen in this trial, it could happen to any common person, former NFL player or not. Suffolk County Assistant District Attorney Patrick Haggan followed Baez’s argument with a thorough review of the commonwealth’s evidence he said indicates Hernandez as the murderer. Haggan noted the handgun and 4Runner, and told the jury that de Abreu lived for 10 seconds after being shot; Furtado died instantly from a shot in the head. A number of Hernandez’s tattoos became the subject of intense debate during the trial: prosecutors admitted evidence of a tattoo they say “commemorates” the shooting. Hernandez’s defense team, which only had a handful of months to prepare their defense after taking on the case in June 2016, made repeated attempts to have the evidence excluded on the grounds of prejudice. Nevertheless, jurors were shown a tattoo they say Hernandez had done in early 2013 that depicts a .38 handgun and five bullets (the same number that killed de Abreu and Furtado). At the same time Hernandez got a tattoo with a gun, a bullet, and a puff of smoke, which prosecutors say depicts the shooting that left Bradley by the side of the road without an eyeball. Additionally, Hernandez got a tattoo that says “God Forgives” at the same time he got the two tattoos that depict guns and bullets. Three counts of armed assault with intent to murder—one count for each of the three passengers in the BMW who were not murdered with de Abreu and Furtado. One count of unlawful possession of a firearm. One count of assault and battery by means of a deadly weapon. One witness intimidation charge relating to Bradley. One of Hernandez’s attorneys, Ronald Sullivan, reportedly “raised concerns” to Boston Superior Court Judge Jeffrey Locke “that reporters may have contacted the woman designated as the jury foreperson, since her name was widely posted to the Internet on Thursday night,” according to the Boston Globe.